Bouquet of gifts from a wonderful magazine for homeschoolers. The Old Schoolhouse is having a special Summer Bouquet of 19 gifts for whoever gets or renew their subscription with The Old Schoolhouse Magazine. But you need to hurry fast because there is only 5000 available. Wondering what the gifts are? 1) SEARS offers a free 10x13 classic wall portrait a value of 34.98$ and no additional session fee. 2) Wildtree is offering one of three sample packages free – choose between Kitchen Staples, Kid 3) Friendly Meals or Decadent Desserts. Sounds Yummy don’t you think? 4) GreenLeaf Press is offering Handwriting by George a copybook based on George Washington’s own Rules of Civility & Decent Behaviour! 10$ value for free. 5) Franklin Springs family media is offering a 20$ gift certificate which can allow you to buy one of their DVDs. 6) Apologia Educational Ministries is offering a 10$ gift card good toward the purchase of any Apologia product. 7) Advent Film Group is offering an online course titled Hollywood: Meet the New Christian Film Movement. 8) Games by Bea is offering a colorful math game that plays like Bingo. VALUE can be used by children from preschool through high school to learn, review, and master math concepts. And it can be family fun night too! How cool is that? A 15$ value. 9) Happy Kids is offering a free 12-month Personalized Photo Calendar. A 19.95$ value. 10) Barnum Software is offering The QuarterMile Math – a practice software for mathematics. A 39.95$ value. 11) A one-year membership license to ICANWRITEONLINE.COM. A 10$ value. 12) Wikki Stik is offering a bundle pack of six kinds of Wikki Stix plus and activity book. A 10$ value. 13) VisualManna is offering Teaching American History Through Art – Book on CD. 14) Library & Educational Services have free books for you in five different categories. These are not e-books. Your gift will consist of three or four books. Retail value of 25$. 15) Light Speed Home Video Learning is offering one free Light Speed Math Program – full-length DVD – shipped postage-free. 16) In The Hands of a Child is offering a free lapbook project pack on CD. 17) SueGreggCookbooks is offering a free Cooking With Children CD. 19) Daystar is offering 10$ gift certificate. 20) Barker Creek is offering two free skill-based activity e-books. 21) Finally, for the first 1000 subscribers – you will receive a handy drawstring muslin bag of sunflower seeds! And to top it off – one of 50 random subscribers will win a free one-week membership to a participating Curves. Subscribe now before this wonderful bouquet of gifts disappears…!!! Want to know more about each gifts? Click here.Want to subscribe to the magazine? Click on the image below to access the Bouquet Gifts! The only sad part is that this promotion is for US citizen only! My oldest is turning 8th today! 8 marvelous years with a son who loves to help and have fun. He likes to climb on the walls, help his younger siblings and loves to learn too! He enjoys the Ga'Hoole series these days as well as the Geronimo Stilton's. 8 years ago we became parents. And we are blessed to have Alexandre in our life. Bonne Fête mon grand. Je t'aime! Which animal do you think is the wackiest, wildest and weirdest? A wacky, wild, and weird look at animals through the eyes of Jungle Jack Hanna! Have you ever seen a naked mole rat? Do you know what a binturong is? Do you know what kind of bird has a deadly kick? Explore the world's wackiest, wildest, and weirdest animals with expert and host Jungle Jack Hanna. The book features thirty animals that are wacky, weird, or wild. Kids will learn amazing animal facts and stories of Jungle Jack's personal adventures with some of these unique creatures. The book includes a bonus DVD with hilarious bloopers from his Emmy award-winning show, Jack Hanna's Into the Wild, and other shows from his career. Jack Hanna is the Director Emeritus of the Columbus Zoo. In addition to writing award-winning children's books, he also hosts the Emmy-award winning, Into the Wild show. He and his animals are frequent and favorite guests of David Letterman and Larry King. My kids were really excited when this book arrived at home. It didn’t take long that the boys were sitting together on a sofa and turning the pages to look at the animals. I’m glad my kids love learning about the animals that we can find everywhere. God was particularly creative with every one of them – think about the platypus for example. Simply amazing! All through the book, Jack is showing us how God thought of everything when he created these animals. It’s amazing to learn new fact about animals. In a way, it has though we can get close to our Creator by understanding the different particularities of the animals. There are facts after facts on many animals and just reading this book could be a good science lesson. This book is just wonderful. I will gladly include it in our library and refer to it every time we will visit a zoo. The book is packed with pictures and very colorful to attract the eyes of the children. You will also learn what an animal eat, where they live, how big they get as well as interesting information about each of them. For example, as humans we have about 600-800 muscles in our body. However, the elephant has about 40,000 muscles in his trunk alone. Yes –you’ve read right all in the trunk. No wonder, elephants can pick up trees with it!!! I strongly recommend this book. This book is different from the other ones I have seen or read in the past. It’s worth the price – believe me. 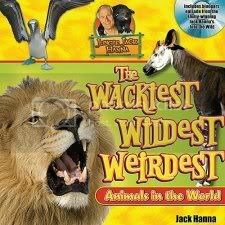 Homeschoolers, if you kids love to learn more about animals, go get Jungle Jack’s Wackiest, Wildest, and Weirdest Animals in the World. You won’t regret it! Jungle Jack’s Wackiest, Wildest, and Weirdest Animals in the World is sold everywhere even on amazon.ca and indigo.ca. Whether you are teaching a class, leading a small group, or just looking for a challenging personal study, these Life Application Bible Studies are for you. With thought-provoking questions, complete lesson format, the full text of the book of Hebrews, and the most extensive commentary available in a Bible-study booklet, this study guide gives you everything you need for understanding God's Word and applying it to your life. This study has an in-depth examination of the book of Hebrews in 13 lessons. It includes the full NLT text and Life Application notes. Ideal for those looking for an application oriented approach to Bible study. Special application questions at the end of each lesson to help you map out your personal action plan. Study notes that are easy to use and understand, covering background, history, geography, and culture. Charts, maps, and profiles of Bible people that present biblical truths in unique and helpful ways. Everything you need in one place! Over 1 million sold in the series (NLT and NIV). From the moment I hold this study of the book of Hebrews, I wanted to start it. What I particularly like from this study is that you will found everything you need in the study guide. You will found the complete text taken from the New Living Translation, study notes, application notes as well as any pertinent information for the study of the book of Hebrews. Also, the second part of the Life Application Bible Study includes 13 read-to-use lessons with pertinent questions that will jolt your thought process and make you reflect on the Word of God. This particular Life Application Bible Study can be used in a group setting or individually. In a group setting, this type of bible study is interesting because everyone can read the Word of God from the same version of the Bible. When participating to various bible studies in the past I found it was a little bit distracting when not everyone were reading from the same version. Each lesson is divided in 5 segments – Reflect on your life, Read the passage, Realize the principle, Respond to the message and Resolve to take action. We all know that to apply what we have read in the Word of God, we need to apply it in our life. In the how to use this Bible Study section, you will also find some suggestions on how to use it from a 60 or 90 minutes study. This period of time gives the user the possibility to digest and reflect on what he/she has read. This Life Application Bible Study will help you to do so. There are quite some spaces to answer the questions and at the end of each lesson you will find more study possibility to deepen your study. However, these extra studies do not have place to write down your thoughts on them. I think it is unfortunate that it is that way. This only thing that bothers me is a claim made at the back of the study book. It is written: “You want your Bible study to help you grow, make a difference, and change your life. This one will.” Personally, I don’t think a book by itself will change my life. What will change my life are the effort and the time I invest in doing the study with all my heart and be willing to be changed by the Spirit while I do it. I think it’s the willingness of the person to apply what he/she has read in his/her life that is important. You can do as much study as you want but if you don’t apply it in your life, it’s worth nothing. You must be prepare to meet with God while doing such a study and expect anything to happen in your own life at the end of it. Two different people can do the same study and reap different results depending of their walk in life and with God. It’s a choice that anyone has to make. Will I be willing to be moved by this study or not? The book in itself won’t do it. Your heart and mind must be there too! I have started the book and I am very impressed with the quality of the questions asked. It makes you think twice before writing down your answers. However, even if it is another fill-in type of bible study, I sense that the questions will make me ponder and take my time before jumping in a quick answer. I personally look forward to dig deeper in the book of Hebrews and be changed by the study. I’m quite excited about this Life Application Bible Study and will bring it on our trip to continue learning about what God has to teach me through the book of Hebrews. 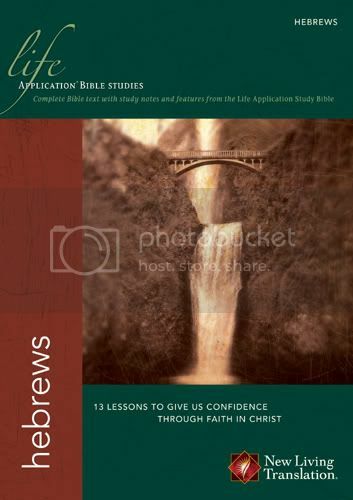 The Life Application Bible Study on the book of Hebrews is available at any Christian bookstores as well as on amazon.ca. Young women are crying out for someone older to care about them, to help them. Older women desire to be useful and productive. Those who have invested years of walking with the Lord themselves desire to be teamed up with this generation of younger women who are yearning for someone to show them how to walk through life with genuine faith in Christ. Transforming Together presents the model for genuine spiritual mentoring through the power and work of Christ in the lives of women faithfully pouring into one another. Women, both young and old, will appreciate the dual focus on the roles of mentor and mentee. 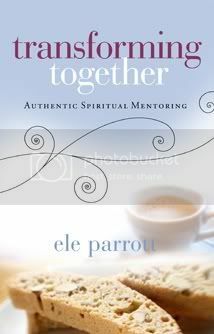 Building on real life testimonies and her experience as a committed mentor, Ele Parrott will guide women as they seek to walk with one another to greater faithfulness in Christ. Ele Parrott, a Biblical Counselor by profession, is the Director of Member Care for the Paraclete Mission Group. She worked as a missionary in the Latin community with OCI for 12 years, has worked in women’s and children’s ministry in her local church and has also been involved in Christian Camping ministry. She continues to lead Bible studies and is the head Mentor Mom at Sun Valley Community Church in Gilbert, Arizona. In addition to Transforming Together, Ele has authored a Spanish-language musical, El Futboles es mi Vida as well as Spanish materials for use in Christian homes and Sunday School classes. Ele Parrot and her husband of 35 years, Don, the President and CEO of Finishers Project, have four grown children and three grandchildren. Being a pastor’s wife, I was interested in the possibility on learning more about mentoring. I just wished I had a mentor with whom I could share my thoughts, my frustrations, my sadness as well as my joys. I believe that God will provide this mentor for me someday. But in the meantime, I want to learn more about becoming one for whoever will approach me in becoming their mentors someday. What I didn’t expect from this book was to be mentored indirectly by Ele. She doesn’t know about it but she opened up some insights in me and made me think about me and my relationship with Christ. She laid down some simple facts about growing with God and I look forward to apply what she taught me. I also discovered that right now at this time of my life, I am definitively not ready whatsoever to mentor someone but I am in need of a mentor. So I pray that God will guide me to find this mentor in my life. Ele also suggested that “a spiritual mentor is in a season of life that requires less of her in her own sphere. Her children are grown or are old enough to allow her time to pray in depth, to be in the Word, and to give time to others outside of her immediate family.” When I read that, I was at first disappointed. You see I have 4 small children aged 8 and under (the youngest being 18 months). My 8 year old is quite independent with a book or even homeschool work but the other three is quite another story. So when I read these words, I was disappointed because I knew that God was telling me not now. Not now? But Lord I am a pastor’s wife after all I will need to guide others eventually! It’s true that at times I might be asked for guidance… but I must also understand that I do not have the flexibility necessary for mentoring. To be a spiritual mentor to someone you need to be a woman of the Word of God, a woman of faith and a woman of prayer. You need flexibility and time to give which I lack right now due to the fact that my own kids are too young. I got the message from God. I will postpone my thoughts about becoming a mentor. I will grow in my relationship with Him and guide my own children for now. Ele also challenges the reader to spend a three-month period to study God’s Word with only the Bible and no other kind of book. I like this idea. I think it’s important for anyone who would like to become a spiritual mentor for anyone that this person knows what he/she talks about – especially when it comes to God’s Word. So for now, as I came to the realization that it isn’t a good time for me to become a spiritual mentor for someone, it will be Jesus and me. Plain and simple. Nothing else. And I think I will take up on her challenge to put aside all books about the Bible except the Bible itself for three months. No bible study, no fill-in-the-blanks kind of book. Just the Bible - every day - for three months. If Ele – or anyone who knows her – would come to read this review, I just want to say that I wished that I could be mentored by you. You have opened up a whole new perspective in Bible Study for me and I am forever thankful for it. I just wished I would know you better by having you in my life. God bless! Transforming Together is available everywhere even on amazon.ca and indigo.ca. Donita K. Paul’s 250,000-plus-selling DragonKeeper Chronicles series has attracted a wide spectrum of dedicated fans–and they’re sure to fall in love with the new characters and adventures in her latest superbly-crafted novel for all ages. It’s a mind-boggling fantasy that inhabits the same world as the DragonKeeper Chronicles, but in a different country and an earlier time, where the people know little of Wulder and nothing of Paladin. In The Vanishing Sculptor, readers will meet Tipper, a young emerlindian who’s responsible for the upkeep of her family’s estate during her sculptor father’s absence. Tipper soon discovers that her actions have unbalanced the whole foundation of her world, and she must act quickly to undo the calamitous threat. But how can she save her father and her world on her own? The task is too huge for one person, so she gathers the help of some unlikely companions–including the nearly five-foot tall parrot Beccaroon–and eventually witnesses the loving care and miraculous resources of Wulder. Through Tipper’s breathtaking story, readers will discover the beauty of knowing and serving God. Who is Donita K. Paul? Donita K. Paul is a retired teacher and author of numerous novellas, short stories, and eight novels, including the best-selling DragonKeeper Chronicles, a series which has sold more than a quarter-million books to date. The winner of multiple awards, she lives in Colorado Springs, Colorado, where she spends time mentoring and encouraging young writers. For me the Vanishing Sculptor was challenging to read. Oh! I loved being transported to a different world where you have dragons and other creatures. But somehow, the way the story was written didn’t help me to stay focused. I did read the whole book because I am not the kind of person who would just leave a book unfinished but I doubt that I would go out and buy the other books from Donita. 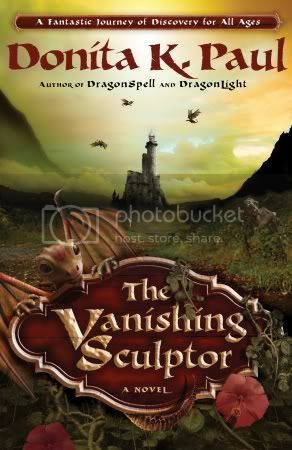 I’m sure other people loves her stories especially the DragonKeeper Chronicles but reading the Vanishing Sculptor didn’t sparkle my interest to the point of investigating more this author. This is a land where dragons live– dragons who speak in your mind if you are incline to listen to them. It is an interesting concept which has been used many times in other novels with dragon characters. I sense a fad in this kind of novels. You find them everywhere from secular authors to Christian authors and passing by even homeschoolers who write. People are attracted to these novels a lot possibly because of the mystic surrounding the beasts. It nice to know that Christian authors like Donita exploits this kind of literature as well. What I found in the novel that I have just read is that even the mention of God in it is not so clear. I would have found it more interesting if all reference to him, as Wulder, would have been more evident at times. Some characters were interesting though – I’m thinking of Beccaroon – the great bird. I would love to see how Hollywood would depict him. As well as the emerlidians who are born pale with white hair with pale grey eyes and as they age they darken. Even the dragons – big and small ones – would be quite a sight on the big screen. Honestly, even though the reading was slow for me I wouldn’t mind seeing a movie done from this book. What I also like from the author is that she took the time to present all the people and give a glossary at the end of her book. The glossary is especially interesting as we present the various races, plants, instruments and so on that is in the novel. If you are a big fan of fantasy, I would suggest this book. It is packed with events related to the quest the main characters are trying to complete. However, I have a feeling that even though this story is from an earlier time and in a different country than the DragonKeeper Chronicles the reader would benefit from reading that series first. The Vanishing Sculptor is available everywhere even at amazon.ca and indigo.ca. Three strangers each encounter the same mysterious storm and awake the next day to find that everyone else has vanished. There's Conner Hayden, a successful but unscrupulous trial lawyer who has forsaken his family for his career; Helen Krause, a middle-aged model struggling to come to grips with her fading beauty; and Mitch Kent, an enterprising young mechanic unable to escape a past that still haunts him. Afraid and desperate for answers, their paths eventually cross and they discover they are being watched. Elusive and obscured in shadows, the "observers" are apparently forcing them to relive vivid hallucinations of events from their past. They discover a mute homeless boy in tattered clothing and believe he may hold the key to the mystery, but the "observers" soon become aggressive and the four are forced to flee. When the boy disappears, the four decide to head from Chicago to Washington, D.C., in search of answers...and more survivors. Winner of the 2006 operation first novel contest, Vanish is a nonstop suspense thriller in the vein of Ted Dekker. Tom Pawlik has a BA in communication and works in the marketing field. He has also been active in Christian teaching, youth work, and music for over 20 years. His first novel, The Way Back, took second place in the 2004 Operation First Novel contest run by the Jerry B. Jenkins Christian Writers Guild, in association with Tyndale House Publishers. His second novel, Vanish, won first place in the 2006 contest. In addition to writing fiction, Tom is also an accomplished songwriter and musician who writes and records at his home studio. He and his wife, Colette, live in Ohio with their four children and one large dog. Mysterious disappearances. Survivors. Weird creatures. A quest for finding other survivors and living… with an unexpected twist at the end. This novel reminds me of the TV series The Twilight Zone. Remember that one? I used to watch it when I was younger – not sure if it were the reruns from the original series or simply the first revival of the series back in the 80s. I just loved how each episode had its own twist and never what I would have thought about. I can hear the series music as I write this – hear it here. As you can read, this novel reminded me of the Twilight Zone. You must guess that I enjoyed reading Vanish by now. Anyone who loved the Twilight Zone would love this novel I think. It’s mysterious enough to keep you on the edge of your seat this whole time. You question many things during the reading. Are they aliens? Is this an alternate universe? What happened to the rest of the people? What is going on? And you arrive at the end of the book with a conclusion you would not have thought of. I enjoyed reading this book and discovering a new author. You can sense that he thought about his characters a long time before putting his ideas on paper. He is exposing the difference between life and death and how our own spiritual life would affect our ultimate destination. Personally I would never have thought of writing about this while using a twilight zone type of analogy but I am sure glad that Tom Pawlik did. It makes you think about your own life decision and your relationship with God. Ultimately, the decision of believing in Him is our own. Have you made yours? If so, do you believe or do you dismiss Him? Think carefully about it if you haven’t decided yet. It’s a matter of life or death. Literally! The way the book finishes, it made me wonder if there will be a sequel to it. Well after a bit more digging, I realized that it is the case. The author has a sequel – published in June 2009 – titled Valley of the Shadow. I’m looking forward to read the sequel someday! In the meantime, if you want to grab a copy of this novel, you can go to any bookstore and ask for it or simply order it online at amazon.ca or indigo.ca. It can also be found at amazon.com! Remember that song... Well a very creative homeschool mom has made her own version of it... Check it out! The shadow of doubt can destroy the most noble of men. Can Sir Dalton rediscover his allegiance before it’s too late? Sir Dalton, a knight in training, seems to have everything going for him. Young, well-liked, and a natural leader, he has earned the respect and admiration of his fellow knights, and especially the beautiful Lady Brynn. But something is amiss at the training camp. Their new trainer is popular but lacks the passion to inspire them to true service to the King and the Prince. Besides this, the knights are too busy enjoying a season of good times to be concerned with a disturbing report that many of their fellow Knights have mysteriously vanished. When Sir Dalton is sent on a mission, he encounters strange attacks, especially when he is alone. As his commitment wanes, the attacks grow in intensity until he is captured by Lord Drox, a massive Shadow Warrior. Bruised and beaten, Dalton refuses to submit to evil and initiates a daring escape with only one of two outcomes–life or death. But what will become of the hundreds of knights he’ll leave behind? In a kingdom of peril, Dalton thinks he is on his own, but two faithful friends have not abandoned him, and neither has a strange old hermit who seems to know much about the Prince. But can Dalton face the evil Shadow Warrior again and survive? Chuck Black, a former F-16 fighter pilot and tactical communications engineer, is the author of nine novels, including the popular Kingdom series. He has received praise from parents across the country for his unique approach to telling biblical truths. His passion in life is to serve the Lord Jesus Christ and to love his wife, Andrea, and their six children. He lives with his family in North Dakota. I am 100% sold out for this author. He’s penmanship is just fantastic and brings the story of God in a Middle Ages setting. Brilliant! It is perfect to attract young people and make them think. In fact, I am planning to get the Kingdom Series as well as the two first books from The Knights of Arrethtrae series. This book is in fact the third book of The Knights of Arrethtrae series but you can easily read it as a standalone. The whole theme behind this book is faith vs. doubt. Another lesson from the book would be how we must protect ourselves from false teaching and stand up for the truth. While we are transported to the medieval time, we also travel with Sir Dalton and other characters as we fight the enemy in Arrethtrae. The author seemed to have researched the medieval times to picture the fighting scenes and the equipment used. The book is packed with adventure and mysterious disappearances as well as great lessons. I had trouble to put down the book while I was reading it. Coming from a book primarily geared for youth and teenager, I think this is a strong bonus. But honestly, anyone in the family could read it. I could even see the books of Chuck Black being used as read-aloud sessions. If you loved the Narnia series from C.S. Lewis or Lord of the Rings trilogy from Tolkien, I seriously think that you would enjoy the books from Chuck Black. As for us, I am putting the rest of the Knights of Arrethtrae series and the Kingdom series on our wish list. These are definitively books that I want my family to read. 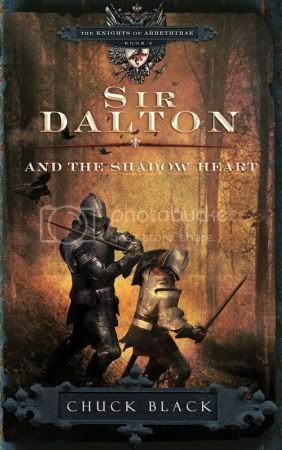 You can find Sir Dalton and the Shadow Heart at any good bookstore and even online on amazon.ca and indigo.ca. For centuries the church has taught and guarded the core Christian beliefs that make up the essential foundations of the faith. But in our postmodern age, sloppy teaching and outright lies create rampant confusion, and many Christians are free-falling for “feel-good” theology. Is God changing His mind about sin? What’s good or bad about the “dangerous” emergent movement? Who is R. Albert Mohler Jr.? R. Albert Mohler Jr. is president of The Souther Baptist Theological Seminary and is an esteemed authority on contemporary issues. A columnist, radio host, and blogger, Dr. Mohler has contributed to The New York Times and the Wall Street Journal; and he appeared on Larry King Live, The Today Show, The News Hour with Jim Lehrer, and The O’Reilly Factor. Dr. Mohler has a doctorate in philosophy from Southern Seminary and has done research at Oxford University. Dr. Mohler and his family live in Louisville, Kentucky. I was honestly curious about this book and wanted to see what the author had to say about false information on God circulating these days. 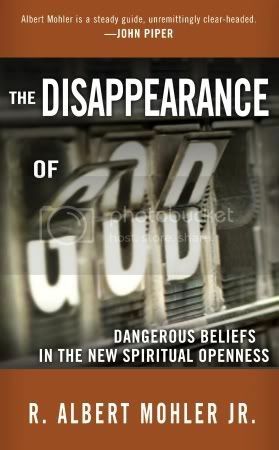 The subtitle itself was attracting: Dangerous Beliefs in the New Spiritual Openness. As much as I wanted to be interested in this book, I must honestly say that Dr. Mohler was not able to keep my interest for an extended period of time, i.e. until the end of the book. Oh I tried very hard but multiple times he just lost me in the complicated terminology he was using. I would not recommend this book for simple folks with no biblical training. If you do, keep a dictionary close by … It seems to me that the author has kept a teacher cap on his head while writing. There are numerous words that many would not understand. This book would however be well received by scholars I think. It would also be a book that could be used as material and discussion in a class at Bible College or Seminary. From what I have read, I also think that the author is writing this book with the perspective of the Southern Baptist – which makes sense since he is himself the president of The Southern Baptist Theological Seminary. However, it would have been interesting to have a broader perspective on the various subjects discussed in this book. The size of the book is interesting as it can easily be put in a bag (even a purse!) and be carried around. And I’m sure that reading about the new spiritual openness would open the eyes and ears of anyone who decides to read more about it. There are false teachings and I think it’s good to be aware of them so that you can protect your mind against these teachings. In conclusion, there might be some interesting points in this book but I can’t tell you more than that. I never finished the book and I have no plans to finish it in a near future. Maybe someday I will pick it up and pursue the reading. This book is available everywhere, even at amazon.ca and indigo.ca. I go out to run some errands. By myself - no kids as hubby is at home. I come back and I have my oldest sort of excited. He says daddy wants to talk to me downstairs (where the office is). So I go. And Alexandre is jumping up and down. And ask me a joke question. I answer not really thinking when he just asked me... and I was wrong in the answer because he tells me no and then tell me the answer. He is still jumping up and down - grinning his biggest smile I ever seen. Anyhow, he is so happy about it. We had sent it to the office in BC which in turned send it to the office in Colorado Springs, US. We had received a letter about it and it was also saying that they do receive lots of jokes and it might not be selected. So they called. It will be published. My son is happy and excited about it. And they will send multiple copies of the magazine. My son will have his joke published. Can you imagine? Every girl is a princess, the daughter of a King… the greatest King who created and rules over everything! Girls long to be loved and adored, and give their heart to their hero. God is that hero! God is that Hero. 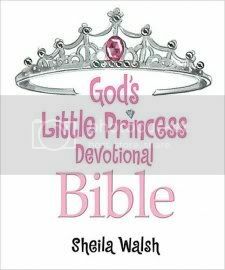 This devotional Bible for young girls uses Scripture selection from the International Children’s Bible alongside articles that help girls blossom into the princesses they were always meant to be. Virtues to create true beauty, such as honor, charity, compassion, sharing, truth, fairness and more, are highlighted throughout the book in fun and engaging ways. This Bible will help little girls learn about their destiny as a daughter of God and a true princess! Features included are: Beauty Secrets, Bible Princesses, My Hero (Scripture promises), Take a Bow (Easy plays that are Bible-focused), I Adore You (Put girls energy to use with songs, scripture and worship), Royal Truths, Down In My Heart (Scripture Memory), Princess Charming, Worthy of Love (Ideas to show how to love her royal subjects: family, siblings, friends and those in the community). Sheila Walsh is a Scottish princess who now lives in Dallas, Texas, with her husband, Prince Barry, and son, Prince Christian. Her loyal subjects are Belle, a fluffy white dog, and Hamtaro, a teddy bear hamster. Geared for girls who are 4 to 7 years old, this Devotional Bible is simply charming. The cover is designed in such a way that it would attract any little girls. The crown has stones imbedded in the book and the word Bible is all sparkly. The drawings that you will find in this Bible are fun to look at and very feminine. I love the fact that various colors and designs are used from one page to another. This will help to keep the attention of the child because you never know what to expect. I particularly love the fact that the author has thought of putting some plays to act out. (hey what can I say – I have a heart for Drama and acting!). But what is interesting is that after each role playing, there is a small section to review act. So mom you ask questions to your daughter and she has to answer them as best as she can. Throughout the book, little girls will read about bible story, have devotions, singing, experimenting with some lessons, and have fun learning about God and the characters in the Bible. It makes me almost wished that I had a bible like that when I was younger. This wonderful jewel of a Bible for little girls is available everywhere as well as on the internet. Check out amazon.ca and indigo.ca. Travelling to Netherlands in Wooden Shoes! When a mammogram result comes back abnormal, midlife mama Summer Finley makes a snap decision to relegate fear to the back burner and fulfill a lifelong dream. Summer heads for Holland where she meets up with tulips, wooden shoes, and her best friend, Noelle. Pen pals since fourth grade, Summer and Noelle have never met face-to-face. Through decades of heart-level correspondence, they have sustained a deep friendship. A week of adventure helps both women trade anxiety for a renewed and deeper trust in God. When Summer confides in Noelle about the abnormal medical report, Noelle finds the freedom to share a long-held heartache, and both women discover they needed each other more than they realized. 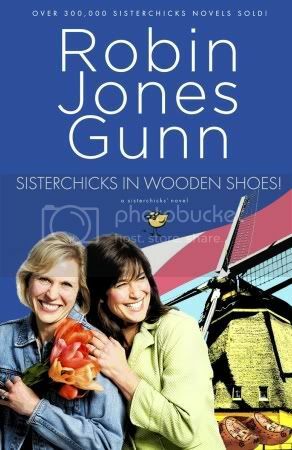 Women ages 35 and up, readers of Christian Boomer Lit, and fans of books such as The Yada Yada Prayer Group will enjoy Robin Jones Gunn’s humorous and uplifting style. True-to-life characters and moments of poignancy bring a deeper understanding of the value of life and the gift of true friends. Readers guide and bonus material included. Who is Robin Jones Gunn? Robin Jones Gunn is the best-selling and award-winning author of over seventy books, including the Glenbrooke, Christy Miller, Sierra Jensen, Katie Weldon, and Christy and Todd: The College Years teen series. The Sisterchicks® series has sold more than 300,000 units, bringing her total sales to more than 3.5 million books worldwide. A Christy Award winner, Robin is a popular speaker, both at home and abroad, and is frequently interviewed on radio and on television. I am 100% hooked on the Sisterchicks series. I bought some a year ago in a clearance section at a Christian bookstore (got the three first ones for 6$ back then and since then I found # 4, 5 and 6 on sale too!) and I discovered an author that touches me in ways I didn’t expect. While I read these novels, not only do I get to travel with the characters to wherever they are going but I learn a lesson from God at the same time. Could you ask for more? I don’t think so. Every time you read a sisterchicks book you will get a lesson from God. This time it is about that no matter what the circumstances, God is close to us and we can have peace about it. What I also like from this series is that you can find a reader’s guide at the end and use it for a book club. In this particular book, the author also explains how she got the idea for this siterchicks book and shows pictures of her own trip to Netherlands. Now the only book I am missing in the series is the one about Britain. I definitively need to get that one to complete my collection… *grin* Britain here I come! Sisterchicks in Wooden Shoes is sold everywhere as well as on the net on amazon.ca and indigo.ca. This is my first time to review a Molly’s Money-Saving Digest and I must admit that I discovered something quite interesting. I tried as much as I can to save on things we buy going from books to clothes to even food believe it or not. Before I wouldn’t have even considered buying meat at 50% off because the best before date was either the same day or the day after! Now it’s a no brainer. If the meat looks good, why not taking advantage of a good price? This specific issue of the Money-Saving Digest is particularly interesting for me because the theme is about frugal family vacations. This is even more interesting for us since we love to travel and discover new places. In this digest, I also discovered about the Hillbilly Housewife and new recipes to try with our family. I salivate already just to think of the wonderful yummy salads in this issue. There is also a section where readers shares how their dad made an impact in their life. I know that my love for photography comes from my dad and for that I am forever grateful to him to have introduced me to this hobby. Finally, I enjoyed reading the stories of two ladies who went on vacation on a small budget and had the time of their life with their families. Sometimes, we need to read stories like that to motivate us to dig and research opportunities of vacation on a small budget. If they can do it, we can to! You can fin Molly's Money-Saving Disgests at The Old SchoolHouse. Recently, I have been asked to preview a new series of e-book published by the Old Schoolhouse. And here's my review for the first e-book of the series. 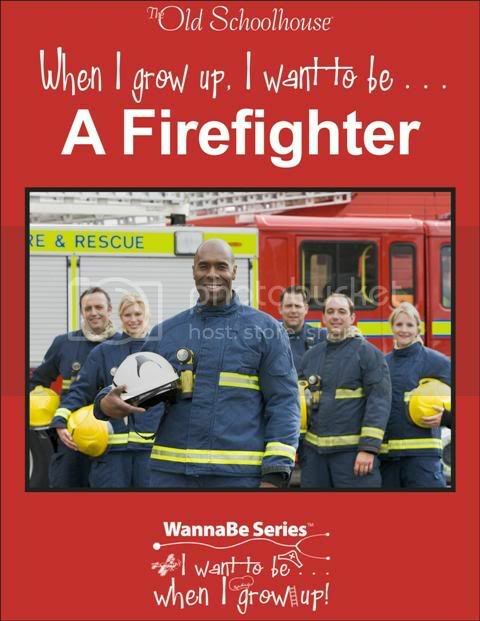 My first thought when I saw the e-book on the work of a firefighter was – Impressive! This e-book is complete to say the least. It has everything to inform the child who reads it about this impressive kind of work from history to reality and even some experiment, copy work and fun activities to do. My only sad note that I have is that I would have like more pictures in it like the different gears of a firefighter and a fire truck. In the building code section, the person who is writing says “Do you remember when I told you I live and work in the southwest United States?”. However, in the previous pages there is no mention of that. That got me confused a little bit because I don’t know who is talking really. Also in the part My Life as a Firefighter, it would be nice to know who is talking and maybe include a picture of the person as well. I think this would make it more realistic for the reader. Besides, it would be clearer to know if it’s the same person writing throughout the whole e-book. I really like that you can find a quiz as well as exercises to practice writing. And you learn a lot about robotic arms too! However, I am left wondering if firefighters are using such a device in their work. I don’t recall seeing such information in the previous text. I think TOS took a lot of time to include all aspects of homeschooling in this e-book going from language art to mathematics as well as sciences. I am very impressed with the quality and the number of activities you can find in this e-book. I must honestly say that I am impressed with this new series. I am looking forward to see what other books will be included in this series. Continue the good work! It is a well-thought series and it is very informative for the kids. I give it a two thumbs up! Right now, there is a promotion for this series. Buy 10 books from the series for only 49$. For more information, please look at the promo link. Oh. And in case you are wondering what I wanted to be when I was younger - I always love animals and wanted to be a vetenarian... but I wasn't too good in chemistry so I switched my options and went into administration when I was in College which lead me to the HEC in Montreal. There I thought that being an accountant would be good but I got hooked in Systems Analysis ie Information Technology in which I did both my bachelor and my Master es Sciences. Being single or married has nothing to do with whether you need to feel loved! Everyone has a God-given desire for complete and unconditional love in all relationships. Originally written for couples, bestselling The Five Love Languages continues to revolutionize relationships. 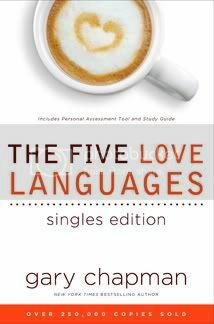 In The Five Love Languages Singles Edition, Dr. Gary Chapman adapts this powerful message to the unique needs of single adults. Understanding and applying the five love languages will enhance all relationships. Whether it’s parents, coworkers, classmates, roommates, siblings, dating partners, or friends, The Five Love Languages Singles Edition provides tools to give and receive love most effectively. Gary Chapman is the author of the New York Times bestseller The Five Love Languages. With more than 30 years of counseling experience, he has the uncanny ability to hold a mirror up to human behavior, showing readers not just where they go wrong, but also how to grow and move forward. He is the host of the weekly one-hour radio program Building Relationships with Dr. Gary Chapman, and has been a featured speaker at the Pentagon and United Nations. He is a prolific writer and conference speaker and makes his home with his wife in North Carolina. Some might wonder why I asked to review this book since it is aimed for singles. The reason is quite simple. I wanted to understand my mom… She is a single woman who has experienced divorce and lack of love in her life. I wanted to grasp how she feels. I think I have an idea… but reaching out to her will take time and patience and tons of prayers for the walls around her heart are high and thick. But with God anything is possible and I want to persevere. I love her and I sense that for years I didn’t speak her love language… This will change. This book is wonderful for any single person on the planet. It can help you realize what your love language is and how you can speak others’ love language to ameliorate your relationship but romantically and with friends/family. At first, the author describes the five love languages and gives plenty of examples. Then the reader will discover his/her love language first and then connect the dots with the immediate family. Gary also talks about the dating relationships and the not romantic ones like roommates, friends, classmates and coworkers. There is also a chapter for single with kids for the single parents out there. A marvelous study guide is included in the book as well as a profile to help you identify your own love language. To add it up, Gary included some questions at the end of each chapter to help you ponder on what you have just heard. This book goes to the point. I am sure that numerous singles out there will be helped with it. You will find tons of good examples on how Gary counseled other to find the love language of a close person in their life and their own. There is nothing better that to learn through examples I think and this book has plenty of them! The Five Love Languages –s ingles edition is available everywhere particularly at amazon.ca and indigo.ca. Exposure - what secret needs to be discovered? When your worst fear comes true. Someone is watching Kaycee Raye. But who will believe her? Everyone knows she’s a little crazy. Kaycee’s popular syndicated newspaper column pokes fun at her own paranoia and multiple fears. The police in her small town are well aware she makes money writing of her experiences. Worse yet, she has no proof of the threats. Pictures of a dead man mysteriously appear in her home—then vanish before police arrive. Multisensory images flood Kaycee’s mind. Where is all this coming from? Maybe she is going over the edge. High action and psychological suspense collide in this story of terror, twists, and desperate faith. The startling questions surrounding Kaycee pile high. Her descent to answers may prove more than she can survive. Brandilyn Collins, known for her trademark Seatbelt Suspense™, is the bestselling author of Violet Dawn, Coral Moon, Crimson Eve, Eyes of Elisha, and other novels. She and her family divide their time between the California Bay Area and Coeur d’Alene, Idaho. Visit her website at www.brandilyncollins.com and her blog at http://www.forensicsandfaith.blogspot.com/ . Her website is http://www.brandilyncollins.com/ . Exposure – what does it mean? According to the Webster dictionary it can be exposing a fact or a condition or disclosing something from the past. The book is quite interesting actually. For about three quarter of the book, I thought that I was following various people who would meet each other at some point. But the more I read, the less they were crossing each other. In a way, this is what the author did… Brandilyn was able to keep me interested during the whole book. I love suspense book and this was different than the other books I have read so far. There is lots of suspense and action going from the main character to other characters at every chapters of the book. Back and forth, from one chapter to the other, you wonder what will happen to all these character. I won’t tell you what is happening but I was surprised and captivated by the conclusion. The epilogue also keeps us wanting for more… and makes me wonder if some day we will see a sequel of this novel. Also, the author used the town where her own mother lives as a background for the novel. Still in this town you could find Tastebuds with their brick-oven pizzas and old-fashioned soda fountain. If I even go to Wilmore, Kentucky, I’ll make sure to visit this place. Sounds delicious don’t you think? In conclusion, this novel is well written and will keep you wondering at every page what will happen and who has done it. I strongly recommend it if you like suspense. 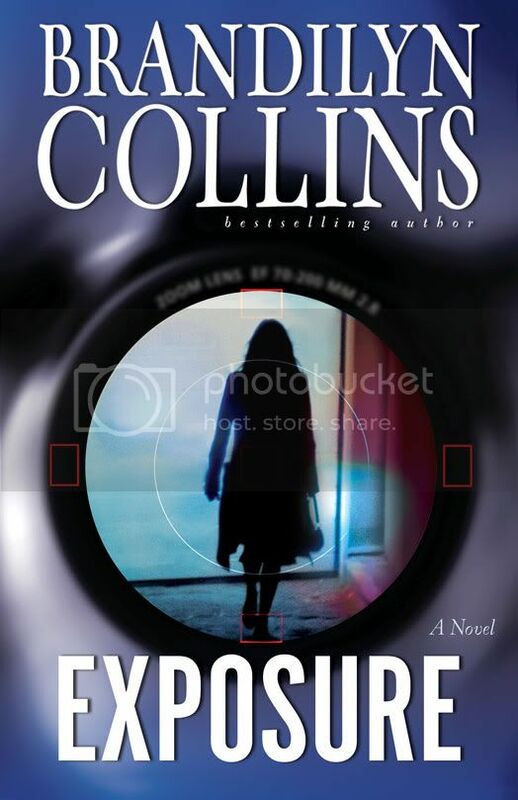 Exposure is available everywhere even at amazon.ca and indigo.ca. UHU Glue Roller - In permanent and repositionable disposable rollers. Acid-free and solvent-free formula. Innovative micro-dot glue pattern means a clean break, no stringing effect. Bonds paper, cardboard, photos, plastics, glass and other smooth surfaces. Dries quickly and can be permanent or repositioned. Adjustment screw for constant tension on tape. Contains 39 ft (12m) of micro dots. I must admit that I was quite surprised when I trid the product for the first time. It does apply micro dots when you use it. Again, this product is acid free and is great for photos, scrapbooks or arts and crafts (like card making!). At first I had a few issues to use the product but then I realized that my 5 year old played with it... How many times will I have to tell him not to play with the things in my office? Oh well! 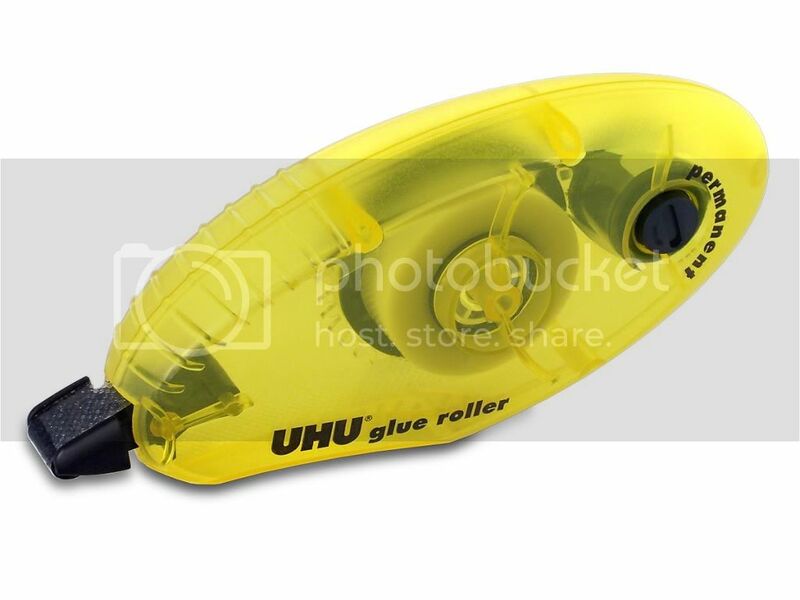 After figuring out that my son had played with the UHU glue roller, I was able to use it with no problem. 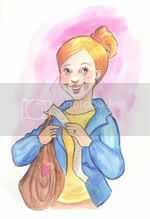 The product applies the glue easily on the paper and you don't have to wait to glue your creation. According to the package, the bond should be instantaneous. However, this time I mostly used it to create an envelop for my niece dedication and I had to apply the glue numerous times for the envelop to stay together. After a couple of months of wait, I was able to get my cricut Expression and used it to cut out the card and the envelop for the dedication of my niece. Then I applied the glue a few times on each side of the envelop to make sure that it would glue properly. It did a great job actually!!! 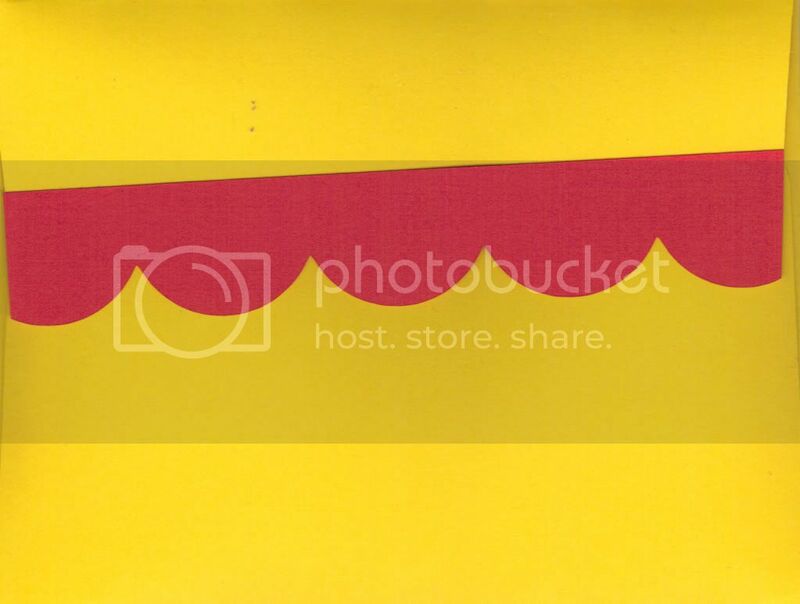 I know the image is not really clear but this is the back of the envelop. As for the card, I used the glue roller for the stamp part on it and I used the UHU Stic for the letters. To my opinion, both glues are wonderful when creating cards and/or scrapbooking.